Do you love the idea of getting back to nature, but don't like the idea of traditional camping? Would you enjoy everything about a vacation in the great outdoors, except for the prospect of waking up stiff as a board from sleeping on the ground? If the answer to both these questions is yes, then Hill Country glamping could provide the ideal getaway you're looking for. Glamping can provide the best of both worlds: comfortable accommodations and modern day conveniences, all located in a beautiful natural setting. See just a few reasons why you should consider a glamping retreat for your summer vacation this year, and contact Mystic Quarry to learn more about our luxury camping accommodations. With its impressive slate of wineries, breathtaking scenery, and array of family-friendly activities all just a stone's throw away, the Texas Hill Country is a slam-dunk choice as trip destinations go. Add in relaxing accommodations that are both unique and affordable, and you can't go wrong. From tiny houses to tipis, Mystic Quarry has comfortable accommodations for small and large groups alike. Camping provides a great opportunity to step away from technology, and simply breathe the fresh air. With glamping, you don't have to give up any of the basic comforts of home in order to enjoy a bona fide nature retreat. At Mystic Quarry, our glamping tipis are outfitted with a king- or queen-sized bed; a mini fridge; air conditioning and heating units; and HDTV with 200 channels. Or, our tiny houses sleep up to 6 people and feature kitchens, full-size refrigerators, on-demand hot water, a flat screen tv and more! Our glamping accommodations let you to enjoy the outdoor atmosphere, but relax in comfort at the end of the day. While there are certainly enough activities to keep every member of the family busy and happy, glamping can also invite guests to unwind and learn what's going on in each other's lives, away from the usual distractions. A few evenings spent around a roaring campfire laughing and trading stories will leave the whole clan wishing the trip could go on forever. Whether you're looking for a rustic getaway or a more luxury camping experience, Mystic Quarry has you covered. 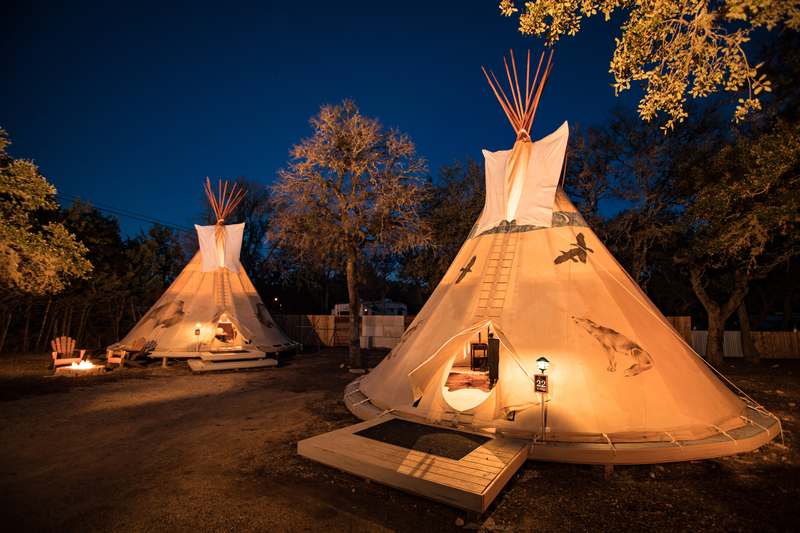 Located in Canyon Lake, our campground offers comfortable campsites, cabins, cottages, and RV sites, as well as the sleek, well-designed, and sought-after Boho tipis. With an onsite pool, volleyball courts, and more accommodations, we provide the perfect setting to make memories that will last for summers to come. Learn more about our location and accommodations, and book your stay online today!